Can Jeff Skinner avoid the sophomore slump and help Eric Staal lead the Canes to the playoffs? Last season, Jeff Skinner surprised most of the hockey world by acclimatizing to the NHL game quickly and winning the Calder trophy. Tuomo Ruutu enjoyed a career year as well, but it was not enough for the Canes to make the playoffs. This time around, Carolina’s hopes will be tied to the success of Brandon Sutter and newcomer Anthony Stewart, who hope to develop more fully and realize their potential. On defense, the Canes shipped out Joe Corvo and brought in Tomas Kaberle to join Joni Pitkanen, Tim Gleason, and the impressive youngster Jamie McBain. Furthermore, the additions of Tim Brent and Alex Ponikarovsky ensure some depth in the bottom half of the line up. 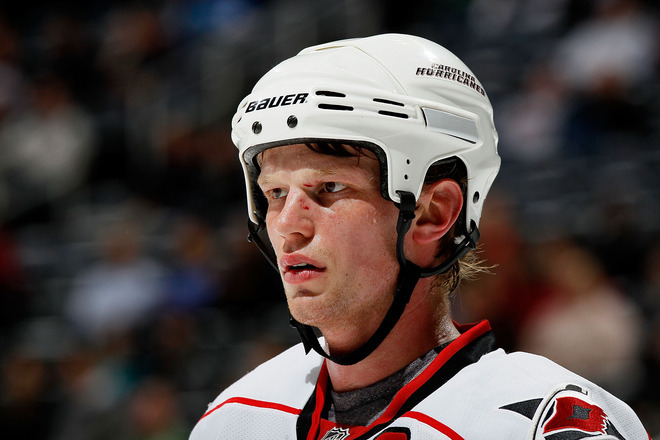 The Hurricanes offer some enticing fantasy options between Staal, Skinner, McBain and Ruutu. Cam Ward is always strong in net and should not disappoint this year. Look for the Hurricanes to finish third in the Southeast division and fight for one of the bottom spots in the Easter Conference playoffs. Carolina has a wealth of young talent and interesting options for fantasy hockey fans, but who is most likely to produce? The undisputed leader of the Hurricanes and one of the most underrated stars of the NHL. A model of consistency, Staal is usually good for at least 30 goals and 75-80 points. This year, expect a bit of a surge. 40 goals and 90 points. The surprising 19 year old burst onto the scene last year and did not let up. 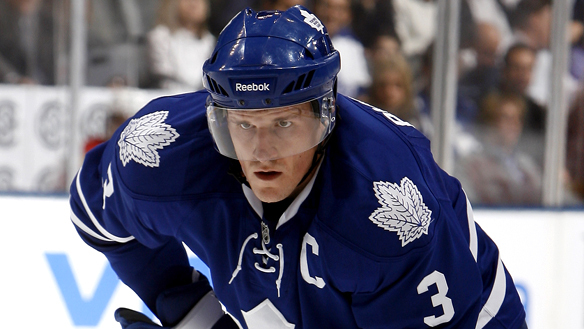 His 31 goals as a rookie and all-star nod in his hometown were both quite impressive. With more attention and expectations this year, expect a minor dip in production. 25 goals and 55 points. The oft-injured winger has been hot and cold, but finally put a great season together last year. 50 points is within reach of he can escape injury yet again. The shootout specialist struggled at times last season, including a poor record in the shootout, but Jussi still managed 52 points. Expect him to regain his 20 goal form this time out, and flirt with the 50 point level. After a successful 39 point year with Atlanta, Stewart signed with Carolina in the off-season. Stewart boasts considerable size and strength and has the tools to develop into a decent power forward. Stewart’s style of play bodes well for him on Carolina, where he could compliment Eric Staal or Jeff Skinner quite well. If you selected Brandon Sutter last year hoping for a breakout, you were surely disappointed. His 29 points were not overly impressive, but he was solid defensively and showcased a solid two-way game. If he puts it together, 40 points are within reach. Sutter may take a few years to reach his peak, but may be a poor man’s Ryan Kesler in a few years. The former Maple Leaf and newly crowned Stanley Cup champion found himself on his way to Carolina this off-season. Kaberle provides offense fairly consistently year over year but can be streaky. 40-45 points seems fair for this vet. The big Finn is evolving into a solid all-around defender. He could use his shot a bit more, and cut down on some mistakes in his own end, but his skill makes him a fantasy option. 35-40 points are within reach once again. The offensive defenseman had a great year last year, and the future looks even brighter. McBain will soon eclipse the 40 point plateau and this may be the year. If you’re in a keeper league, this guy is the real deal. One of the most heavily worked goaltenders, Cam Ward has been a consistent performer ever since the ‘Canes Cup victory in 2006. Barring injury, Ward is a lock to play 65-70 and amass 35-40 wins. Five or six shutouts are also a very realistic possibility. If the Hurricanes make the playoffs, Ward’s reputation should only increase. Boucher was part of a revolving door of goalies in Philadelphia last season. Boucher can always step in and start a few games, but usually finds his way back into second fiddle. A reliable back up, Boucher should get 10-15 games. The big winger surprised many last year in Atlanta after taking a while to bloom. The Florida Panther draftee finally found his game and did not look back. Stewart amassed 39 points while mostly playing on the bottom two lines, so his numbers are not misleading. If Stewart was given an opportunity to play alongside Eric Staal this year, he may enjoy a breakout similar to his brother Chris Stewart. After tallying 57 points in 61 games in the AHL, Dalpe has shown that he can score at the professional level. Carolina has some young scoring forwards already in the lineup, so it may be difficult for Dalpe to crack the lineup. That being said, Dalpe did have a 15 game audition last year, where he tallied three goals and one assist. There’s a chance Dalpe can make the team and have a minor impact this year. What else is there to say about this young defender? His tremendous shot and excellent offensive instincts were on display last season in his first full year. After amassing 30 points last season, he seems poised for at least 40 this year. The departure of Joe Corvo would have opened up more power play time for McBain, but Tomas Kaberle’s presence may complicate things. Whomever starts the year on the powerplay, McBain will get his chances and the point on the Hurricanes power play will one day be his.